The first Apple computer seems positively antique by today's standards. Hand-built by Apple co-founder Steve Wozniak in SteveJobs' parents' garage and first introduced at the Homebrew Computer Club inPalo Alto, Calif. 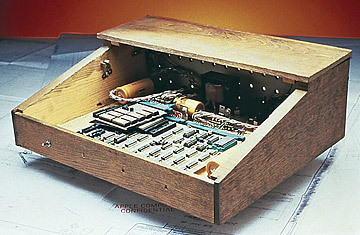 In 1976, the Apple 1 was originally a do-it-yourself kit which didn't even come with a case. Even so, as the first all-in-one microcomputer that, once hooked up to a keyboard and monitor, didn't require extra circuitry to display text, it was a giant step forward over the competition. It came as a kit and sold for $666 (not for satanic reasons, but because Wozniak apparently preferred repeating digits). More than 200 unitswere sold by the Byte Shop, an early computer store. In 1999, the Apple I sealed its place as the most collectible PC of all time  one lucky tech aficionado scored $50,000 for his original Apple I. From the TIME Archives: 1983  "The Updated Book of Jobs"